Facebook, Twitter, Google...today's tech-savvy students are always plugged in. However, all too often their teachers and administrators aren't experienced in the use of these familiar digital tools. If schools are to prepare students for the future, administrators and educators must harness the power of digital technologies and social media. 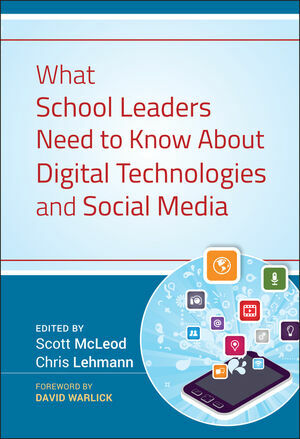 What School Leaders Need to Know About Digital Technologies and Social Media reveals the power of information technology and social networks in the classroom and throughout the education community. Scott McLeod is an associate professor of educational leadership at the University of Kentucky in Lexington, Kentucky. McLeod created the first graduate program built specifically to prepare tech-savvy school leaders at the University of Minnesota. A recognized expert on K-12 school technology leadership issues, McLeod works with corporate and non-profit institutions to move schools into the 21st century. McLeod also serves as the founding director of the UCEA Center for the Advanced Study of Technology Leadership in Education (CASTLE) and writes the popular education blog, Dangerously Irrelevant (dangerouslyirrelevant.org). Chris Lehmann is the founding principal of the Science Leadership Academy in Philadelphia, Pennsylvania. This groundbreaking school, which integrates technology throughout classrooms and administration, has been recognized as an Apple Distinguished School and was named one of the "Ten Most Amazing Schools" in Ladies Home Journal. Lehmann was named one of the "30 Most Influential People in EdTech" by Tech & Learning magazine in June 2010 and has received several other distinctions and awards throughout his career. He is a regular speaker and the author of the Practical Theory blog (www.practicaltheory.org). Visit techtoolsforschools.org for additional resources, interviews with chapter authors, and more!